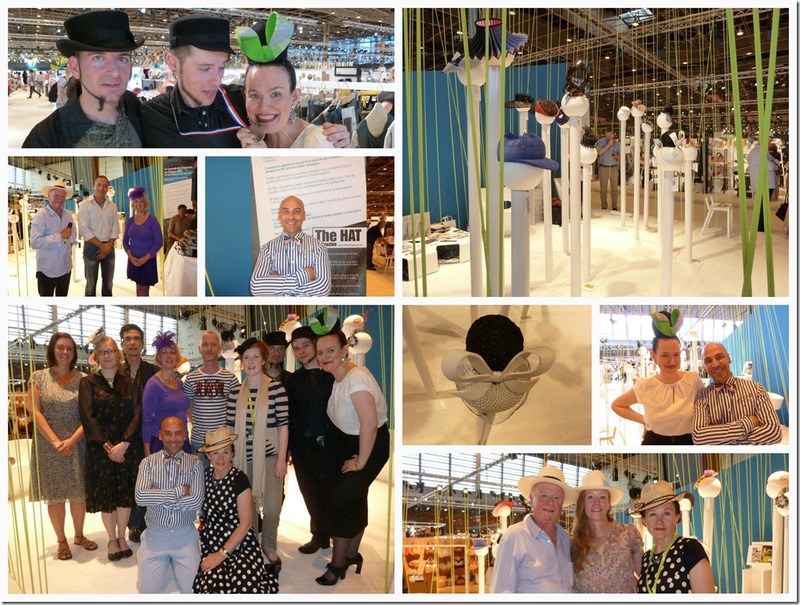 The competition Hat Designer of the Year is organized by The Hat Magazine. Every year they decide on a theme and invite professional milliners to participate. On 2010 the theme was Steampunk, and this year it was La Dolce Vita. 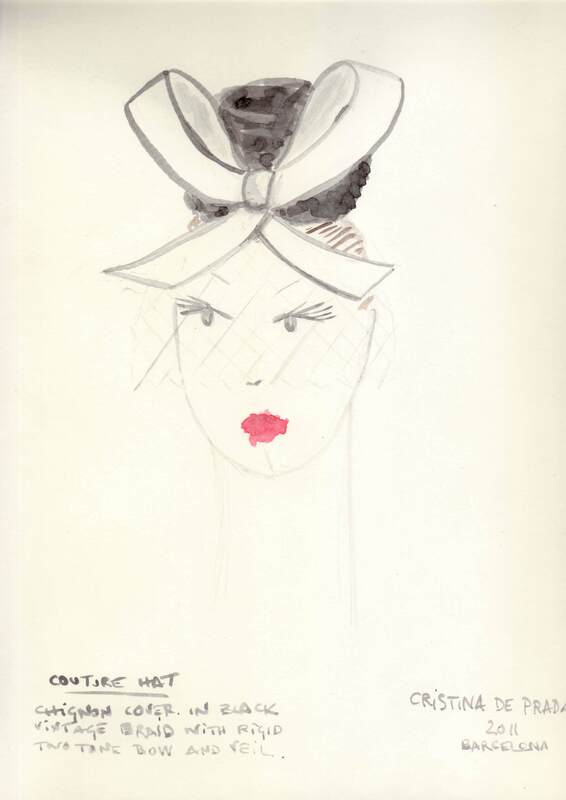 The participating milliners have to design a collection of 6 hats (2 haute couture, 2 blocked, 2 pattern) and send sketches to the magazine. From those sketches the judges select a few that have to actually make 3 hats from their collection. 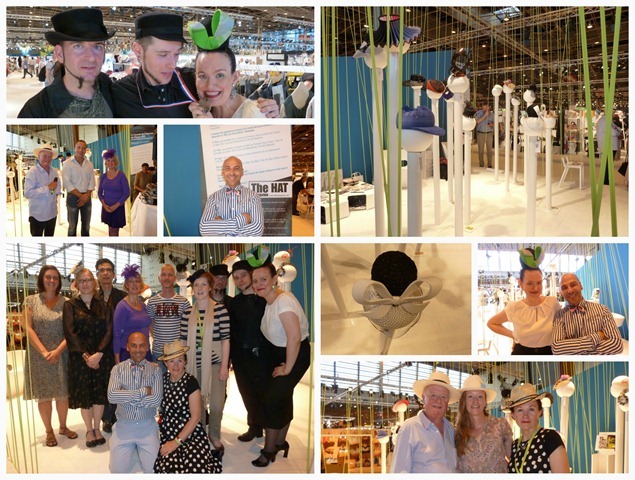 From the finished hats, 6 designers (or 9 this year) are selected to go to the final. All finalists except for Kerrie Ann Meaton-Baker (from Australia) came to Paris for the final that took place at Premiere-Classe. The hats that made it to the final were all very nicely displayed at the center of the trade show, and after the prizes were announced there was champagne for everyone. Here are some pictures of the event. On the top left corner I’m with Felix Weber and Dirk Seegmüller trying to shamelessly steal away their 2nd prize medal (it did not work, unfortunately). Under that picture on the left is Nigel Denford of The Hat Magazine with the representative of the Florence based hat company Marzi, awarding the industry prize to Emmy Jaarsma (who also won the 1st prize and popular vote), and to its right is judge Elvis Pompilio. Underneath that a group picture and on the right there’s a general view of the exhibition, a pictue of my hat and a picture of myself with judge Elvis Pompilio. Finally a lovely picture of the Denfords: Nigel, Alice and Carole. On the group picture above you can see, standing: Beth Simpson, Ani Stafford-Townsend, NamQ Park, Emmy Jaarsma, Dirk-Jan Korstchot, Jill Simpson, Les Incroyables (Felix Weber, Dirk Seegmüller) and Cristina de Prada. Seating: Elvis Pompilio and Carole Denford from the Hat Magazine. All in all it was a lovely experience and I’m really happy I got to be in the final and meet all these lovely people! Congratulations Cristina!! What an amazing accomplishment . PS You are a Hit in Los Angeles! Of course! Thanks for sharing, Cristina! Wondering why your leather hat was not included, because I just love it. Do they choose which of your hats are to be displayed…or do you? Anyway, I love looking at everyone’s take on the theme. Congratulations on being in the Finalists. So well deserved! Thank you Montez! Thank you Jan! Why was the bubble lether hat not included? That’s an interesting question. I did not want to delve into that, but since you ask, here’s what happened. Initially the rules said that 6 milliners would be chosen, and their 3 hats would be exhibited on the final. In the words of the judge Elvis Pompilio “there were too many interesting hats”, so they changed the rules by choosing 9 milliners and showing a range of 3 hats (only in the case of Emmy Jaarma, who won), 2 or even 1 hat (my case and one other. The judging process is a very personal one and there’s very little to be said on that subject. I cannot deny it was a disappointment for me to have my leather bubble hat outside of the final, but I’m still grateful that I made it to the final even if it was only with one hat. I did a lot of research and worked hard to present hats that fit the theme (La Dolce Vita) and at the same time were novel, unique and finished to very high standards. Some of the hats in the final, to my eyes, had little to do with the “la Dolce Vita” theme. But again, there’s little to be said since it’s the judge who decides, and themes can be interpreted in many different ways. Having said that, I’m very proud of my hats, their design and their finish, and that gives me an enormous personal satisfaction. Also, the level of workmanship was very high and everyone had their own unique style, it must have been really hard for the judges to decide, and I’m really happy for the winners which surely deserved it. Got to say it was an honor and a pleasure being there with you! I forgot to say that all those wonderful pictures were taken by my brother Joaquín!! Thank you Joaco!! Thank you Samantha, Thank you Wendy! Felicidades por el trabajo tan fantástico. Creo que el éxito de una persona no se mide por los premios recibidos, se mide por la satisfacción del trabajo personal. Congratulations Cristina. Remember that judging is subjective and sometimes political. The first thing I look at is workmanship and believe me you are a winner. I know it’s can be disappointing, but remember that the winner is not always the best. I can’t believe your bubble didn’t place. It was so innovative and technically awesome. Next year…right? 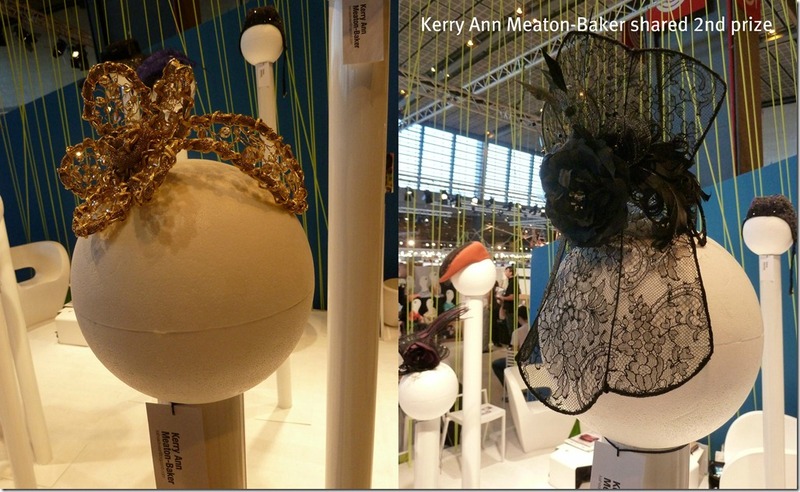 The chance to hang out with such talented milliners: what a dream of a lifetime come true.